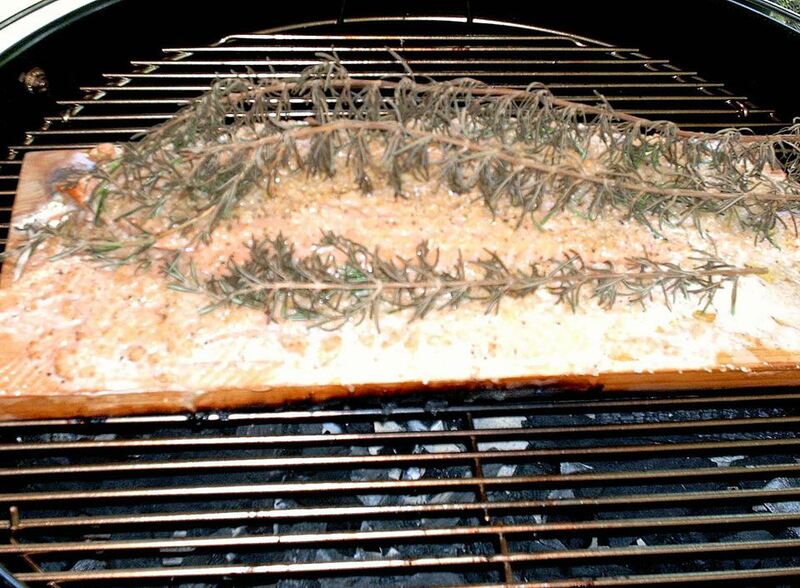 Salmon Fillet on Plank with Rosemary. Regarding BBQ Inc. This healthy grilled salmon recipe gets flavor from the smoking cedar plank under it and from fresh rosemary sprigs laying on top of it. Oh, yeah and a healthy dose of garlic too. So, stay healthy, grill salmon, and enjoy. Soak cedar plank in water for 30 minutes. Place salmon fillet on plank. Pour lemon juice over the fish. Evenly coat the fillet with garlic, salt and black pepper. Place rosemary sprigs on top and place on grill over medium heat, until internal temperature of fish reaches 145 degrees F, in the thickest part. Watch to make sure that the cedar wood doesn't catch fire. You can pour small amounts of water on the wood around the edges if it starts to get too charred. Once cooked, remove from heat and serve with your favorite side dishes.